Discover a family-friendly, elegantly affordable hotel in the heart of Pigeon Forge within walking distance of area attractions and popular restaurants. 198 beautiful rooms, indoor and outdoor pools, free continental breakfast, and more await you. 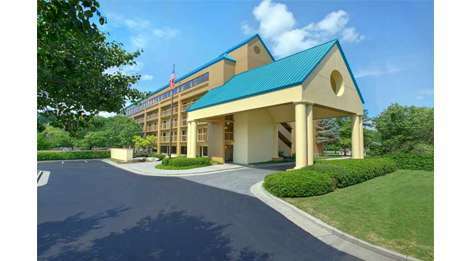 All of the Pigeon Forge accommodations at Quality Inn are located between two separate buildings. In Building A, you’ll find our check-in lobby, as well as our 24-hour indoor pool, sauna, hot tub, and kiddie pool. There are four floors in this building and a centrally located elevator. In Building B, you’ll see a fantastic view of the mountains from our collection of Smoky Mountain hotel rooms. Our continental breakfast is held in this building, and outside are the outdoor pool and hot tub. There are five floors in Building B, along with a centrally located elevator.